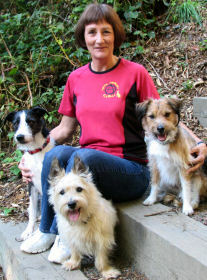 Corinne started in flyball with her Cairn Terrier, Duncan. She first ran with her Total Anarchy friends at the 2008 CynoSports, and was so hooked that she moved north from California in January 2009 to join us permanently! Corinne has since retired Duncan, but she is kept busy running Havoc and Topo, and getting her newest pup Power ready for the race lanes.